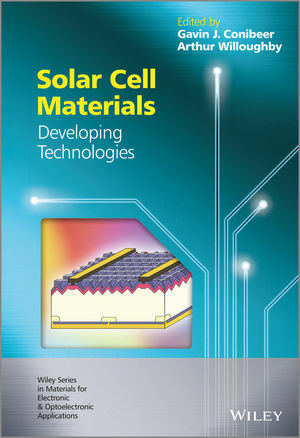 This book presents a comparison of solar cell materials, including both new materials based on organics, nanostructures and novel inorganics and developments in more traditional photovoltaic materials. 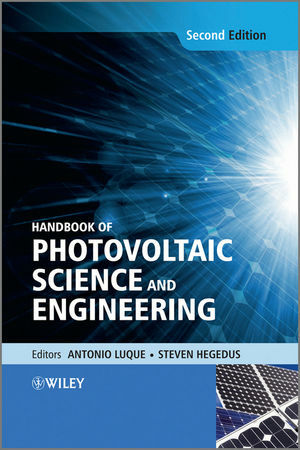 It surveys the materials and materials trends in the field including third generation solar cells (multiple energy level cells, thermal approaches and the modification of the solar spectrum) with an eye firmly on low costs, energy efficiency and the use of abundant non-toxic materials. Dr. Gavin Conibeer is Deputy Director of the Centre of Excellence for Advanced Silicon Photovoltaics and Photonics at the University of New South Wales (UNSW, Australia). He has a BSc (Eng) and MSc (London) and received his PhD at Southampton University (UK). His research interests include third generation photovoltaics, hot carrier cooling in semiconductors, phonon dispersion modulation in nanostructures, high efficiency thermoelectric devices and photoelectrochemical generation of hydrogen. As well as numerous publications, Dr. Conibeer has also given a short course on Third Generation Photovoltaics at UNSW and a unit on Photovoltaics for the Open University (UK). Professor Arthur Willoughby is currently Professor Emeritus at the University of Southampton having retired from Southampton after many years teaching. He holds a BSc and PhD in Engineering, both from Imperial College, and was head of Engineering Materials at Southampton for more than 10 years. With research interests focussed around semiconductor materials, Arthur Willoughby is founding editor of Journal of Materials Science: Materials in Electronics for Springer as well as principal editor for Materials Letters for Elsevier. He has written multiple journal articles as well as book chapters for Springer and MRS, and is a series editor for the Wiley Series in Materials for Electronic and Optoelectronic Applications.